OceanStar Energy Services Ltd. - OTHER PRODUCTS & SERVICES. We are committed to providing our Clients with innovative , cost effective products and services that are driven with quality and value. Detailed below are the specifications for the vessel stabilizers on offer. M8000, M21000A and M26000. M8000 gyro is a more powerful version of the original Model 7000 unit. Designed for easier installation and higher performance, it actively stabilizes vessels with displacements up to 35 tons. It is the perfect choice for discerning owners wanting a complete stabilization system that works equally well at zero-speed and at anchor and also while underway. For larger vessels, multiple units can be installed to achieve the desired stability characteristics or the new M21000 can be utilized. Resonant boat roll is the most disorienting contrast with dry land experience and the least desirable motion on a boat. Uncomfortable, tiring, and probably the greatest cause of seasickness, it has been an unavoidable price to pay for many for the pleasure of being on the water. Employing the principles of gyro-dynamics,the vacuum-sealed gyro stabilizers exert a powerful righting torque that virtually eliminates boat roll without any need for drag-producing or damage-prone protrusions or appendages from the hull. The builder is responsible for supplying 208-230 VAC (+/- 10%), 50/60 Hz, single phase power on a 30 Amp service to the Motor Drive Box and 24 VDC on a 10 Amp service to the Control Box. 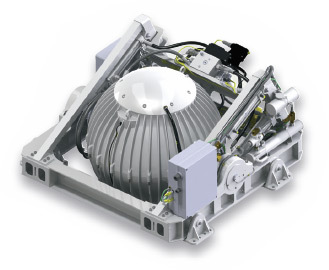 The Gyro bearings and Motor Drive Box are cooled by a closed glycol cooling loop that incorporates a sea water heat exchanger. The builder is responsible for providing 15.1 lpm raw water at ambient sea temperature and 6.9 Bar maximum pressure to this heat exchanger. The ambient air temperature in the compartment in which the Gyro and Motor Drive Box are mounted should not exceed 60 C.
The boat builder or yard is responsible for designing the foundation to which the Gyro’s saddle beams are attached and for ensuring that this foundation can safely transfer the concentrated Gyro loads from the saddle beams to the adjacent hull structure. The brake system automatically locks the Gyro so it cannot generate excessive anti-rolling torque loads in the event of a system fault or alarm, loss of electrical power or loss of brake pressure. The brake system can also be locked from the Keypad or by shutting off power at the circuit breaker. The Gyro is a torque device and therefore does not have to be installed at a specific forward or aft location or on the centerline. However, the Gyro should not be installed at forward locations in a high speed boat where the vertical accelerations exceed ±1 G (0 to 2G range). A Keypad and small Display are provided to start, operate, monitor and shutdown the Gyro. Sensors, alarms and shutdowns are provided to allow unattended operation. Sensors measure flywheel bearing temperatures, vacuum pressure, motor and drive temperatures, gimbal angle, brake pressure, and ship motion. Gyro operating history during faults or alarms is recorded in the controller's memory for subsequent recall by a qualified service person if needed. M21000A gyro is perfect for larger vessels. 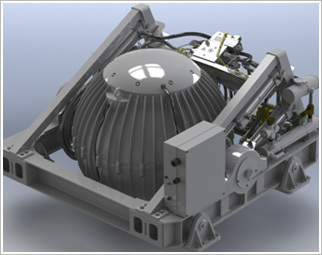 Able to actively stabilize most vessels with displacements up to 90 tons. M21000A is the perfect choice for discerning owners wanting a complete stabilization system that works equally well at zero-speed and at anchor and also while underway. For larger vessels, multiple units can be installed to achieve the desired stability characteristics. The unique state-of-the-art motion control system actively regulates the hydraulic braking system to ensure the anti-roll torque is maximized for all hull designs and for the ever-changing operating and sea conditions. The ambient air temperature in the compartment in which the Gyro and Motor Drive Box are mounted should not exceed 50 C.
The boat builder or yard is responsible for designing the foundation to which the Gyro's saddle beams are attached and for ensuring that this foundation can safely transfer the concentrated Gyro loads from the saddle beams to the adjacent hull structure. The Gyro should not be installed at forward locations in a high speed boat where the vertical accelerations exceed ±1 G (0 to 2G range). Sensors, alarms and shutdowns are provided to allow unattended operation. Sensors measure flywheel bearing temperatures, vacuum pressure, motor and drive temperatures, gimbal angle, brake pressure, and ship motion. The Gyro controller sends sensor values and alarm information to the display and also locks the brake and shuts down the motor drive in the event of a fault or alarm condition Gyro operating history during faults or alarms is recorded in the controller's memory for subsequent recall by a qualified service person if needed. 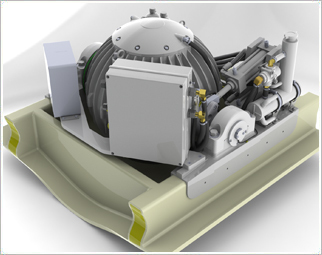 The M26000 is designed to achieve up to 60 to 80% roll reduction on vessels up to 100 tons (typically up to 100 ft). Multiple units can be fitted for larger vessels. The M26000 requires only modest electrical power, has no outside appendages, and can be installed off centerline, if necessary. Its computerized control and vacuum technology makes it the first truly practical, and only modern, anti-roll gyro. Copyright 2010 OCEANSTAR ENERGY SERVICES LTD. All rights reserved.